Despite being the constant reminder of “Maintain Silence Please”, Akanksha found her librarian to be the most cheerful teacher amongst all. It was truly a mystery for Akanksha that how could a person spend her entire day amid books and maintaining a catalog for them, also she considered librarians to be quiet & studious but she was amazed to see how Mrs. Dass was so good in cultural activities like singing & dancing & also headed the Book Review club in her school. On one such occasion of Teachers’ day Akanksha asked Mrs. Dass what motivated her to take up the role of a librarian as a career option. She answered her student’s keen question in a very simple manner by saying that there was a certain sense of freedom with which students interacted with a librarian. There’s no hitch when students interact with their librarian, they’ll always be sure that a library teacher would never evaluate them. To add humor to their conversation Akanksha stated that she found the library to be the safest haven to bunk her sports’ period. • An interested student can take up a yearly course in “The Bachelor of Library & Information Sciences”,(BLISc) after the completion of his graduation. • Certain colleges also provide certificate Course in Library & information sciences which can be taken up after class 12th. • The One year Master of Library & Information Sciences after their Bachelor in Library Science degree. • One must love books and have good communication skills. • Should know how to handle books with care. • They should aptly gauge the readers’ need while helping them with their choice of books. • A librarian should be aware of the latest publishing trends, should keep track of leading publishing houses & the genre for which they publish books. • With the applications of Information Communication Technology (ICT) a role of a modern day librarian goes beyond just issuing books. He should upgrade his skills & should be able to store, retrieve, & spread information with the aid of modern day ICT tools. • For example necessary archival documents & reading material should be stored in CD-ROMs for the ease of distribution & preservation. • A Modern Day Librarian should not just give what a reader wants but should also give his suggestions on most appropriate resources for the purpose of reading. This could be in the form of CD-ROMS, e-books& e-library. • A modern day librarian should necessarily equip themselves with these skills- related computer technology & precise ways to search for information. • They are the ones who should be the torchbearers of initiating change from traditional methods to modern techniques & educating the visitors to the library. They should hold work-shops, discussion panels to showcase how well the library is equipped & what changes do the patrons of the library want. • In the age of facebook, blogs, twitter chats, a modern day librarian can use these social media tools very effectively. • As a social media pro a librarian can build a dedicated facebook page for the respective library & should be proactive in inviting users to like the page and become members of this online community. The librarian should find time to regularly update the page with the recent set of activities at the library, new additions in terms of new books bought. • A modern day librarian should arrange for an audience for their patrons in book-launch events as an initiative for community connect. 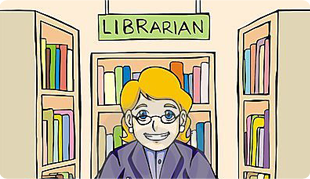 A librarian’s role is as dynamic any other profession. They need to constantly upgrade their skills to find creative ways of retrieving different information for varied set of readers. Needless to say modern day librarians have evolved themselves to meet social and technological needs. There’s lot of vibrancy attached with a librarian’s day-to day activities such as dealing with information in many formats, including books, magazines, newspapers, audio recordings (both musical and spoken-word), video recordings, maps, manuscripts, photographs and other graphic material, bibliographic databases, web searching and digital resources. They are also responsible for providing assisted equipment for people with disabilities, and help with finding and using community resources.